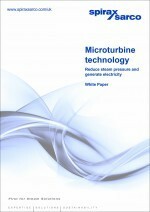 The company says the White Paper provides a clear and easy-to-understand guide to this technology and highlights the cost and energy savings that steam system operators can expect to achieve by using microturbines. Most steam systems raise higher pressure steam in the boiler, then reduce the pressure before the point-of-use. By using a microturbine, the steam is reduced to the required pressure as it travels through the turbine, with the energy released by the pressure drop being used to generate electricity. The electricity produced can be used locally, for example to run pumps or other equipment, or exported to the power grid, cutting utility bills and overall carbon footprint.